I came by David Einhorn's Don Quijotean saga of a 6-year long fight by pure chance. All I knew was that Einhorn was a hedge fund manager for Greenlight Capital, a prominent short-seller and critic of Lehman a year prior to their demise. 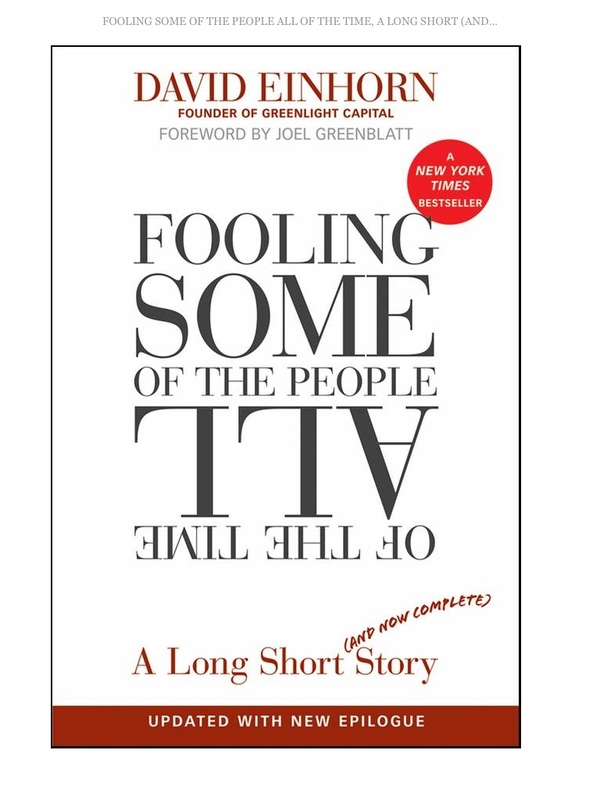 As usual, I didn't read the description when I bought the book – so I was quite surprised to find out that it was not about Einhorn shorting subprime bonds in late 2000s (which apparently he never did), but about his 2002 short position in a midcap public PE and SME lending outfit called Allied Capital. Now, who the F are Allied Capital and why read 400 pages about them? Turned out, it didn't matter that much. Allied was the villain, or so it seems – but the book is not about that at all. Or not only about that. The book is about extreme example of acute shareholder activism – and from a guy who shorted the stock! Our very own enfant terrible Alexey Navalny should envy the level of detail, attention, investigation efforts and time invested in this position. I seriously doubt most fund managers do anything close to that kind of thing – the guy is simply amazing. Greenlight's fight against Allied started from an investment idea speech (quite an interesting and funny one!) at a charity investor conference. Essentially, Einhorn claimed a company misstated accounts. As a result, he endured a 6-year long libeling campaign by Allied and a number of government authority investigations only to prove he was right in the first place! He even had his phone records stolen by his corporate adversary – not in Russia, no Nemtsovgate – in the US! I am struggling to remember whether I heard about Navalny in 2006. 6 years is a lot! On the reading side, the narrative gets boring from time to time as Einhorn is extremely methodical in putting all arguments in an exhaustive fashion, never missing a beat. Not a single shady disclosure on page 87 of the appendix to the quarterly report is missed. Basic accounting knowledge required, huh. Still, a great find and a great read. Proves 2 things: (a) governments are malfunctioning everywhere, and (b) talent won't suffice, you need persitance. True indeed. The Byrne performance reminded me of something Warren Buffet once told me about the difficulty of shorting the stocks of companies run by crooks, because they'll fight dirty to save themselves. “The crook's life depends on it,” – Buffet said. Arguably, the biggest difference between Allied and Bernie Madoff's Ponzi scheme is that Allied went through the motions of actually investing the customer money while Madoff didn't even bother.